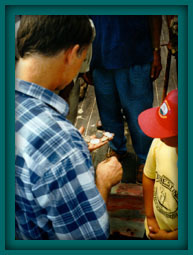 In January 1994, new legislation was written and offered by Senator Mark Montigny and Representative Tony Cabral and signed by Governor Weld that established a new structure for the Schooner Ernestina Commission, designated the schooner as the official vessel of the Commonwealth of Massachusetts and specified the placement of the Commission within the Department of Environmental Management. This key measure lead to a rebirth of the ship and a more secure future. In Charlemont, artisans carve a mast for storied schooner. The Ernestina, one of the last of the old Essex fishing schooners, sits in a marina on the Massachusetts coast, badly in need of a new mast. About 150 miles away, in the states western hills, a 137 foot-tall white pine lies felled in a field near the deep woods of the Mohawk Trail State Forest. The twain are beginning to meet in a sunlit meadow by the Deerfield River, as woodworkers saw, chip and chisel away three tons of bark and wood from the 7-ton, 120-year-old tree to turn it into a mast for the 100-year-old ship. Except for the power tools, the scene is like one a century old, too. Craftsmen just dont work this way anymore. "This is similar to a lot of work we do," said Jim Kricker, 43, of Saugerties, N.Y. "Were taking an irregular shaped timber and making a regular shape out of it." "It sounds crazy," said Wayne Ford, 33, of Denver, N.Y., as he measured the 3-foot diameter pine too begin cutting. "Were going to take a round tree, make it square and make it round again. But thats how you do it." Ford and Kricker work for Rondout Woodworking of Saugerties, which specializes in restoring old boats and old water-powered sites. 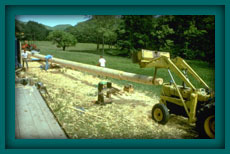 Beginning with a two-man chain saw and finishing with hand tools, they will carve the pine down to a mast that is 80 feet long and tapers from 20 inches to 17. This area was once a rich source of such trees - Mohawk Trail State Forest even has a grove of "old growth" trees - but they were almost never used in the state. Instead, such trees were called "Kings pines," branded with an arrow, and sent back to England for use in the shipbuilding trade. Gregg Swanzey, 41, captain of the Ernestina, tramped the woods of Massachusetts and New York State for months to find a tree with the height, width and straightness needed for a mast. Department of Environmental Management forester Joanne Nunes of Pittsfield found this one and, two weeks ago, local forester Norman Hicks felled it. With a new mast, Swanzey hopes to have Ernestina sailing out of New Bedford by July. The ship is now owned by the Department of Environmental Management, which intends to operate it as a sailing museum. And if Congress passes a bill designating New Bedfords historic district a national park, the Ernestina will become a major part of it. According to Rep. Antonio Cabral (D-New Bedford), the state has committed another $100,000 this year to complete the repairs, including the $25,000 to $35,000 required to replace the mast. The state and the City of New Bedford will also provide financial support. So, with new management, increased public support, and now, a new mast, Swanzey says he hopes the Ernestina will begin its second century with yet another era of glory days. "I didnt know if Id ever see this moment," Swanzey said. "Now its going to be easier to invest in the ship." Gov. William F. Weld, looking to put the schooner Ernestina on a solid foundation, was due to swear in a new and expanded state commission today to oversee the operations of the historic ship. The swearing in of the nine-member commission - which will include two members from New Bedford, Carl J. Cruz and Pauline Macedo - was scheduled for this afternoon at the Whaling Museum, where the commission is expected to hold an organizational session. Gov. Weld also was due to announce $370,000 in grants and program funds to support the schooner. The money includes $200,000 from the state Department of Environmental Management for capital repairs and debt relief, a $70,000 grant from the state Office of Travel and Tourism for hiring an interim director and two part-time staffers and insurance, and $50,000 each from the Department of Youth Services and UMASS Dartmouth to operate recreational and summer youth programs in conjunction with the vessel. Some of the $370,000 has already been advanced to the schooner. "The members of this commission will guide the Ernestina through a new era as she becomes an invaluable educational and recreational tool for the youth in the New Bedford region as well as an ambassador of goodwill for all the citizens of Massachusetts," Gov. Weld said in a press release announcing the new Commission. "This is a new beginning, with a clean slate," said State Rep. Antonio F. D. Cabral, D-New Bedford, who sponsored legislation last year to expand the commission from five to nine members and increase accountability for the ships operation. "The commission will have the opportunity to set a new course for the Ernestina." "I think the governor has really made it clear that this is a ship of Massachusetts," said Mr. Cruz, who was an original member of the Ernestina Commission and currently serves as president of the Ernestina-Morrissey Historical Association, a support group for the vessel. He also said he hopes the commission can be an active catalyst for fund-raising on behalf of the vessel "so we can ensure the ship will be around for another hundred years." "Were hoping to get everybody working in harmony for the betterment of the Ernestina and the Cape Verdean community," said Mrs. Macedo, who also has been a member of the Ernestina-Morrissey Historical Association for four years. Mimi McConnell of Cotuit, executive director of the Coalition for Buzzards Bay. Peter J. Lawrence of Duxbury, president of the Boston Marine Society, vice-president for marine operations with the American Overseas Marine Corp. in Quincy and a member of the board of visitors at the Massachusetts Maritime Academy. H. James Brown of Cambridge, professor of city and regional planning and director of the joint center for housing studies at the JFK School of Government at Harvard University. Blair Brown of Newton, principle owner of Charrette, an architect supply firm. Under the legislation sponsored by Rep. Cabral, Dr. Robert Antonucci, state commissioner of Department of Education, Peter Webber, commissioner of Department of Environmental Management and Abbie Goodman, executive director of the state Office of Travel and Tourism, or their designees, will also automatically serve on the commission. The legislation has also designated New Bedford as the Ernestinas official homeport. As the long arm of the 65-ton crane eased the mainmast of the schooner Ernestina into the air like some giant toothpick, 7-year-old Barry John DePina looked on in wonder. "Look at it," he called as the crane guided the 85-foot mast to the historic schooner at the D.N. Kelley and Sons Shipyard. It was a moment to savor Thursday as the 100-year-old schooner again began to take on the look of a sailing ship as workers re-stepped its mainmast and the new 80-foot foremast, recently fashioned form a 130-foot white pine cut from the Mohawk Trail State Forest in Western Massachusetts. "Its nice to have them both up there in place," said Gregg Swanzey, interim director and captain of the schooner, who said he hopes to see the vessel rigged and completing its Coast Guard inspection in the next few weeks. "Its a fresh start in many ways," Mr. Swanzey said. Peter Webber, commissioner of the state Department of Environmental Management and a designated state member of an expanded state-appointed commission overseeing operations of the vessel, called it "a wonderful day in the second century of the Ernestina." Officials hope the schooner will be ready to take part in the citys Summerfest and Blessing of the Fleet at the end of the month. Also, a newly reorganized and expanded state Ernestina Commission is considering several options for sail training and passenger programs through the balance of the sailing season. Also on hand for Thursdays ceremonies were Reps. Joseph McIntyre, D-New Bedford, and John Quinn, D-Dartmouth; and state Sen. Mark C.W. Montigny, D-New Bedford. Also, descendants of families with ties to the historic schooner - which has been a Grand Banks fishing schooner, an Arctic exploration vessel and a Cape Verdean packet ship - took part in the event. There was a ceremony involving the longtime maritime tradition of placing coins under the masts. Set underneath the masts were an 1894 coin marking the schooners launching in Essex in February that year; several Cape Verdean coins; an Ellis Island commemorative coin to mark the ships history as an immigrant ship; a seal of the city of New Bedford; and a 1994 silver dollar to mark the beginning of the schooners second hundred years. "I have a lot of emotions," said Tina Mendes, granddaughter of Henrique Mendes, who owned and operated the Ernestina during its days as a Cape Verdean packet. "This ship is a symbol of hope and past accomplishments and future accomplishments." "This is wonderful to see this ship is coming back to life, and is going to succeed," said Fred Littleton, the immediate past chairman of the state Ernestina Commission who, as a young man, was a crewmember aboard the vessel when it sailed the Arctic under Capt. Robert Bartlett. "I know my great-granduncle would be very proud the boat is still here, still serving people," said Capt. Kermit Morrissey, grandnephew of the original owner of the vessel - which, as the Effie M. Morrissey, was launched as a Grand Banks fishing schooner in February 1894. Two sons of Capt. Mendes, Joseph S. Mendes and Arnaldo Mendes, said part of their late father survives in the Ernestina. Among those taking part in the ceremony were Carl J. Cruz and other members of the Schooner Ernestina Commission; Joseph Andrade and Ms. Mendes, descendants of Capt. 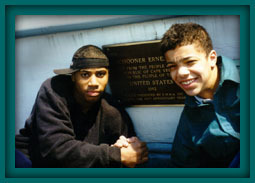 Mendes; Barry John DePina, whose parents have been supportive of the schooner since it returned to the United States in 1982 as a gift from the Republic of Cape Verde; Dewitt Clement Littleton, grandson of Mr. Littleton and Capt. Morrissey. Schooner Ernestina received an additional certification as a passenger vessel from U.S. Coast Guard (Subchapter T) after certain modification such as blanking off a watertight door between the focsl and the main hold area and moving inspection ports on the fuel tanks. 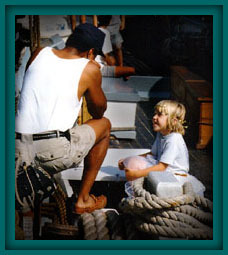 This step enabled operations to include daysails and other community-based activities to be possible when programs were less devoted to sail training which is a pre-requisite for Sailing School Vessel operation. The 1994 sailing season began with a Centennial Celebration at the Blessing of the Fleet in late July thanks to a great effort by Claudia Belleau and Capt. Tom Grace. "The vision we have for the Ernestina centennial celebration is to promote the original purpose of the gift. When the Cape Verdean government gave her to the United States, the idea was to promote cultural exchange," said Claudia Belleau, artistic director for ACCESS, which is promoting the celebration. Presenters at the celebration included Toi Fortes who put together Tonkas Tumblers; John Joli Gonsalves with songs, stories and folklore; Cape Verdean Womens Folkloric Dancers with traditional dances in costume; musical group Tropical Power; sea stories form Capts. Norman Gomes and Tom Grace; Ramona Bass with African folktales; great jazz from Semenya McCord and Herbie King as well as John Harrison III; The Rum-Soaked Crooks; The Beans; and Blake & Sullivan with Vic Witherspoon (Irish and American folk). "Tom Lopes of the Cape Verdean News has really helped with the promotion, said Ms. Belleau. "The Cape Verdean Vets will be offering a taste of Cape Verde, cooking and serving traditional dishes." The year was marked with some other crucial achievements including the authoring Commission by-laws and policies, payment of more than $110,000 in debt accrued over the past several years, establishment of an office, development of a brochure and bringing the financial audits up to date. 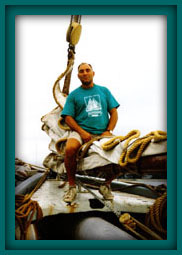 On Veterans Day, November 11, 1994 the Schooner Ernestina received a plaque commemorating the gifting of the ship by the Republic of Cape Verde in memory of Joseph Cardozo, former director for the Commission, who had recently passed away. Carl Cruz, president of the Ernestina-Morrissey Historical Association (EMHA) and dignitaries from the Consul Generals office in Boston were on hand for comments along with the color guard from the Verdean Vets in New Bedford. This event marked the significance of the gift in the hundredth year and helped shaped her launch into her second century in 1995. 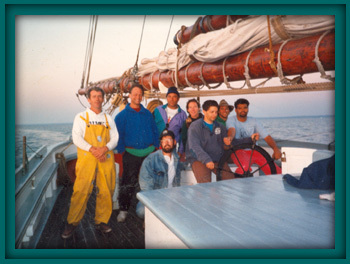 Some of the people who helped shape the Schooner Ernestina programs for years to come came aboard in 1994. Tom Goux, a noted maritime musician and Falmouth music teacher was hired as program coordinator and Capt. Amanda Madeira came aboard as chief mate. Traudi Coli had already been studying the packet trade for years and expanded her involvement through the onboard programs and festivals. 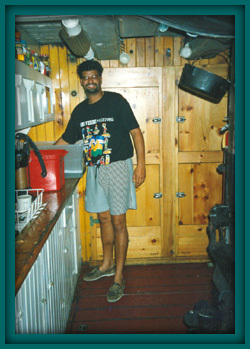 1994 Shipboard Crew ~ Many volunteered their time. Thanks!